Yes, more plaid! I absolutely love this plaid coat. I have been wanting it ever since I spotted it online a few weeks ago! It is so different than anything that I have in my closet! 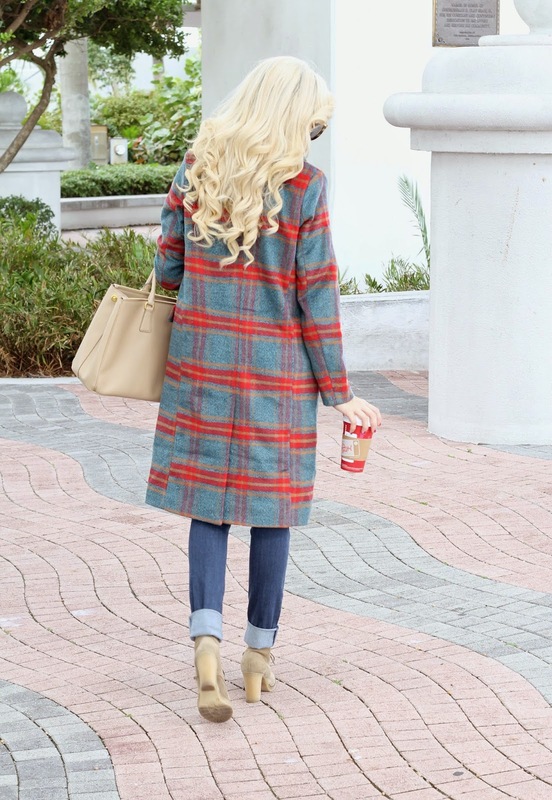 Plaid can be worn with so much that this coat will go with a ton of stuff in my closet. Yesterday I just wanted to wear it with a simple t-shirt. Mostly because my belly is getting so big (I think she had another growth spurt) that it is challenging to fond tops that don't make me look like a whale. So I wanted something fitting. Fantastic coat and boots! You look gorgeous in this outfit! That plaid coat is to die for! I love how you styled it! This coat is amazing and I love the booties! These colors could not be prettier! Have a wonderful weekend Jade. beautiful colors! you look so sweet! Love this look! I have a plaid coat, so I love the inspiration. Love this look! That bag and coat are amazing! You have got to be the cutest pregnant person EVER! I never got the pregnancy glow with my two but you just look amazing! That is a gorgeous coat, You are just stunning and gorgeous as a pregnant girl. I like your Starbucks cup together with yout coat! Simply stunning! Must dig out mine! I know how yo feel...I already feel huge and I'm only 22 weeks!! Whats your secret to staying so tiny preggers?? What a super gorgeous coat!! !